See the 3 million stitch tapestry that took 9 women 8 years to make and is so well done it looks like a photograph! The Voortrekker Monument stands like an ancient obelisk over the city of Pretoria. Its vast, angular form looks out of place on the dry African hilltops; like a faraway alien race formed the beginning of a city but moved off before work was complete. It is completely alone on its pedestal surrounded only by the scrubby bushland and endless blue sky above. 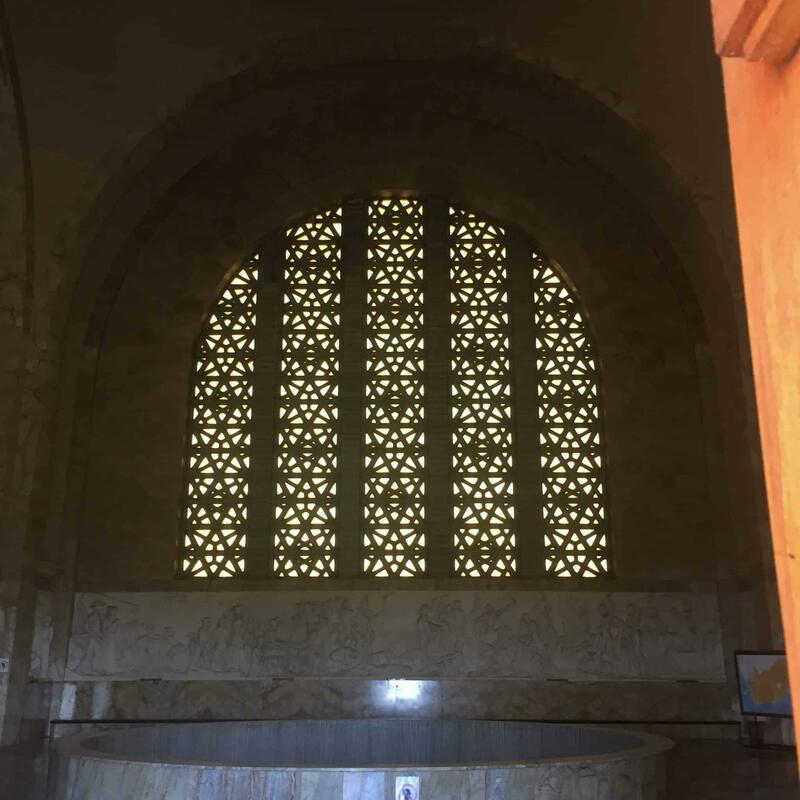 Closer inspection gives over more subtlety, the four vast rectangular panels are infilled with wide arched windows and these infilled again by a triangular pattern weaved into stars amongst stone stacked columns. 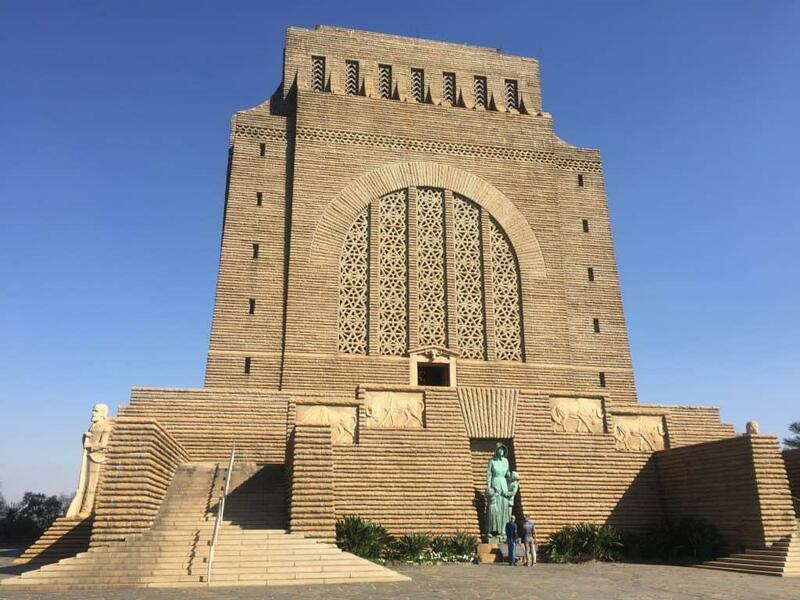 On each corner of the square building stand massive statues of some of the key Voortrekker leaders; Andries Pretorius, Piet Retief, Hendrik Potgieter and an ‘Unknown Leader’ symbolising all the other Voortrekker leaders. I pulled up to the car park outside, less worried about the architecture and more seeking somewhere to quench my now raging thirst. The winter in Africa is dangerously dry; Zimbabwe its cousin to the North is now seeing crippling droughts move from 1 in 10 years to 3 in 5. Whilst the heat today topped out at a gentle 22 degrees, the parched nature of the air is something that’s hard to describe feeling like every breath gradually turns your mouth from lake to desert. Everything just seems completely devoid of moisture and I had managed to plan out my day in such a way as to avoid both breakfast and any refreshments on the way over from the Union Buildings and Freedom Park. I hopped out of the car and after having a look up the grand staircase towards the monument my eyes were drawn to something far less inspiring – plastic chairs. These could only mean one thing, the promise of refreshment. I shot up the lower part of the stairs in a scene somewhere between Ice Cold in Alex and Rocky 3. 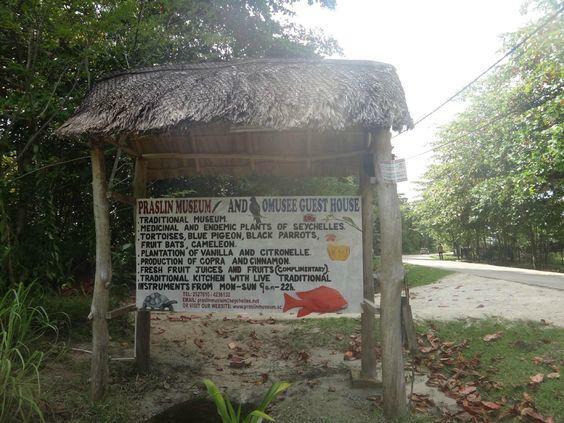 My only fear was that it was closed. It was the middle of the day, the monument was busy, there were tourists everywhere – all signs suggesting a restaurant would do good trade – but this is Africa and logical thinking does not always pay off. 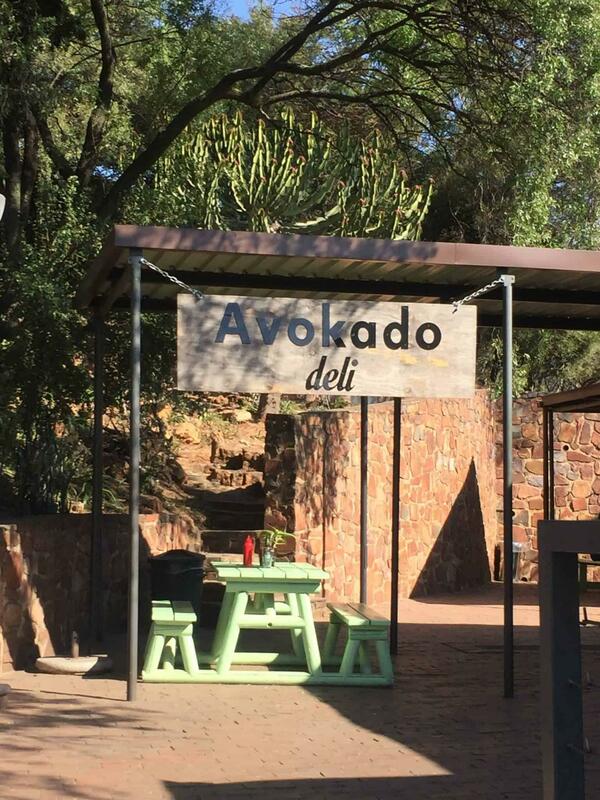 Thankfully though my prayers were answered and I was greeted by the very welcome entrance to Avokado Deli. Inside was the cheery character of Hennie desperately trying to resolve the pedantic queries of one of the multiple American tourists amassed on site. The woman was tall, with long limbs and her hair pulled back tight as if trying to remove the creases from her weather beaten skin. She was clearly well traveled but went about her business in the obnoxious and apathetic manner that is all too typical of tourists from the US. She spoke at a volume completely unnecessary for the situation, either trying to make clear she was creating a scene or completely unaware of how rude she was being. It seems South African coffee was not up to her high tastes with strength, flavour and temperature all cited as reasons to go to battle. She used height to her advantage, leaning over the counter getting ever closer to the still smiling Hennie. He resolved the situation with a heady mix of smiles, apologies and sarcasm, the last of which completely bypassed his friend from the USA but brought a broad smile to my dehydrated face. He offered the lady another coffee for free, which put her into instant retreat. This was South Africa in a microcosm; friendly, generous and with personalities big enough to charm even the coldest of hearts. She walked off, his face continuing to beam out his rain stopping smile but his eyes suggested he was memorising her features for some voodoo ceremony later that evening. I lined up my assortment of goodies on the counter – a litre of water, crisps, an ice cream – and then placed my order for a burger. I wasn’t messing around here. It had been a long morning exploring the Union Buildings and Freedom Park and my normal morning strategy of no breakfast had seriously backfired. He handed me my receipt and started chuckling. “You’ll never believe it” he said “you’re order number 103 but you also owe me 103 Rand. That doesn’t happen much”. The world needs more Hennies, if it did we’d all see the world through a more optimistic lens. After polishing off my food and made my way up to the Voortrekker Monument now more ready to take it all in. Dad had brought us here as a kid and I had flashes of memories but not many – a hole in the ceiling and some ox wagons was about as far as it stretched. I seem to recall feeling forced to come up and visit many years ago but now here I was with a free afternoon rocking up under my own steam. There’s no accounting for taste, but at least they are maturing; then I was disappointed to leave my Game Boy and copy of Zelda in the car, now making a conscious choice to come and visit. Despite numerous signs to the contrary, maybe I haven’t turned out too bad! I passed a teenage rugby team on my way up posing for a group photo on the steps. Kitted out in blue and white tracksuits made of staticy, sweat inducing man-made fibres that glistened in the sun. I assumed they were a touring team from the UK; an assumption made on skin colour alone – there was not a black face amongst them. Surely this could not be a team from a country where only 8% of the nation is white? I was wrong, they were from Pretoria. Whether this is a slight on the inclusivity of game of rugby or the city itself I’m not sure. I made my way up through the first set of stairs getting ever closer to the entrance of the Voortrekker Monument. The upper area is enclosed by a ring of 64 ox wagons built into the wall as if to protect the monument from attack. They are only slightly three dimensional with the frames of the wagons sticking out a few inches from the wall itself. They each had two visible wheels, with the back being larger than the front like drag car racers. Every fourth car had a spotlight built into the cabin which were pointed back at the monument ready to bathe it in white light after the post sunset darkness descended. 64 is apparently exactly same number of wagons that were used at the Battle of Blood River to form the laager. The entrance way was flanked with two staircases which spilled between their enclosing walls like water from busted guttering. 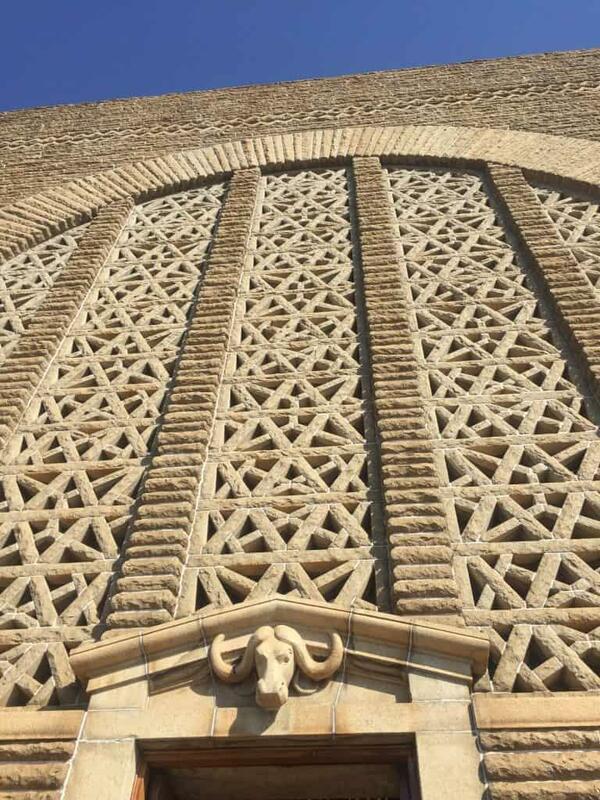 I made my way up to the grand doorway and made eye contact with a stone ox bust above the door who was peering down from his vantage point. It can’t be a bad life, he certainly has an incredible view down over the city. Making my way through the doors felt akin to walking into some ancient cathedral in Rome. The temperature instantly drops due to the coldness of the stone and the hushed noises from the crowds are surrounded by an endless reverberation that only comes from vast spaces. When compared to the kind of buildings we spend most of our times in; houses, offices, shops, buildings of this capacity are almost incomprehensible. I got a quick photo from just inside the door worried that photos wouldn’t be allowed inside but – after showing my sticker at the desk – it seemed I hadn’t broken any bylaws with only ‘professional photography’ and ‘drones’ listed on the notice as being unacceptable. Signs like this always make me intrigued as to what prompted them in the first place. It must have been a specific incident, but who on earth brings a drone into a historic monument like this!? It seemed common sense to me, in the same way a sign for ‘no juggling flaming chainsaws’ was also unnecessary. But clearly someone at some point had decided drone flying in one of the most revered buildings in Southern Africa was a good idea. 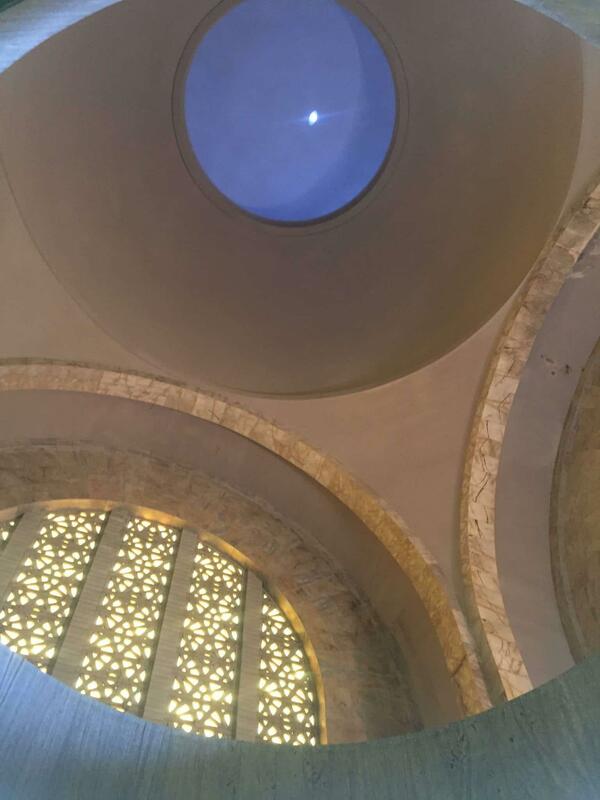 The floorplan of the Voortrekker Monument is an almost perfect square but looking up offers that vertical immensity that gives me vertigo even though I am on ground level. My brain kicks in and makes me unsteady, fearing the worst imagining every scenario where I could be that height from the ground. There is a certain irony that a building can be holding so much air and also take your breath away. Above the frieze on each side are giant arched windows yellow in colour, like the tobacco stained ceilings of an old smoking room. They bring in enough light to make the entirety of the hall visible, but keep it dim enough that it is easy to draw comparisons with the great stain glass windows of British cathedrals. The windows drew my eye up the convex self-supported dome with a tiny chink of light bouncing its way through the inside of a pipe like gouge to the outside world (more on this later). Looking up brought on that weird sense of ground based vertigo again. I did the only logical thing and headed for an almost hidden corridor in the corner of the room with a spiral staircase noting ‘ascent only’. 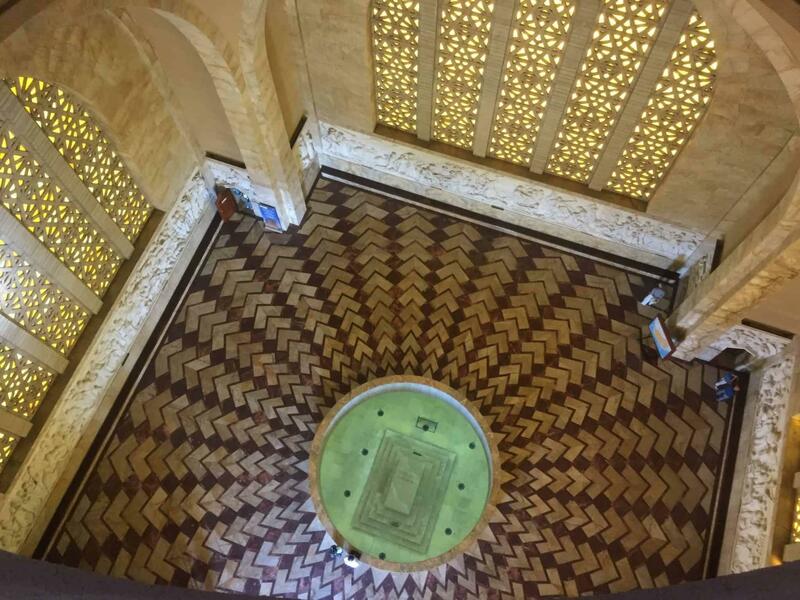 The view from the top was magnificent, straight down onto the petal like concentric structure of the granite floor which draws the eye in to its centre. 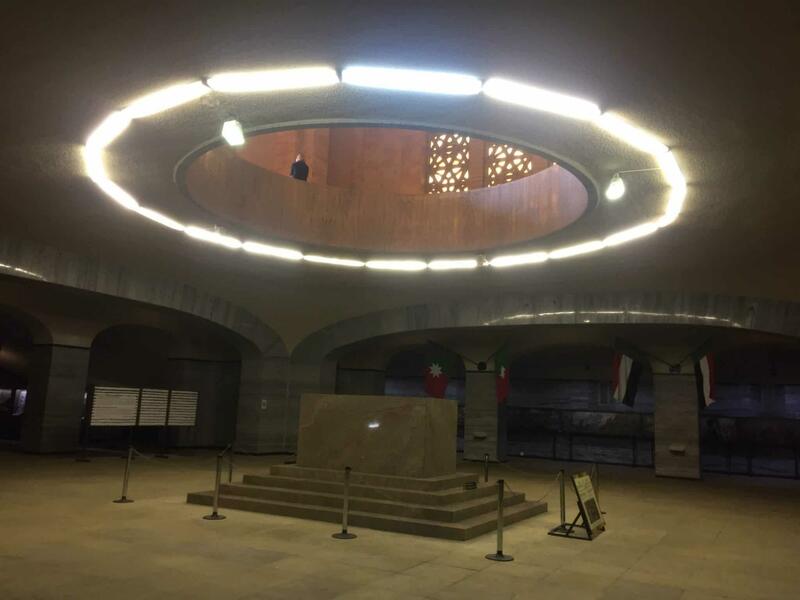 This revealed even further depth – another, lower level under which a large stone cenotaph was perfectly centred. Well I say they view was fantastic, I never really saw it first-hand. My fear of heights has gradually accelerated over the years. As a kid remember shooting up ladders cutting down the sour grape vines surrounding our house. Now I can barely even think of being at height without coming out in sweats. The whole way up the 15 floor spiral staircase I had recited ‘do one thing that scares you ever day’ over and over again in my head for courage. When faced with the top I froze. If this structure was in Europe the edges would be encased in plastic giving you a complete feeling of safety. This being Africa the barrier between me and a 40 metre drop was a 4ft high concrete wall that most people were leaning over. People always quote health and safety going mad, right now I wish it’d shown a bit of insanity on the African continent. I inched towards the edge, held on tight, pulled my phone out of my pocket and took a few photos over the edge with my clammy, shaking hands. It was a wonder I drop the thing down to the granite floor below. 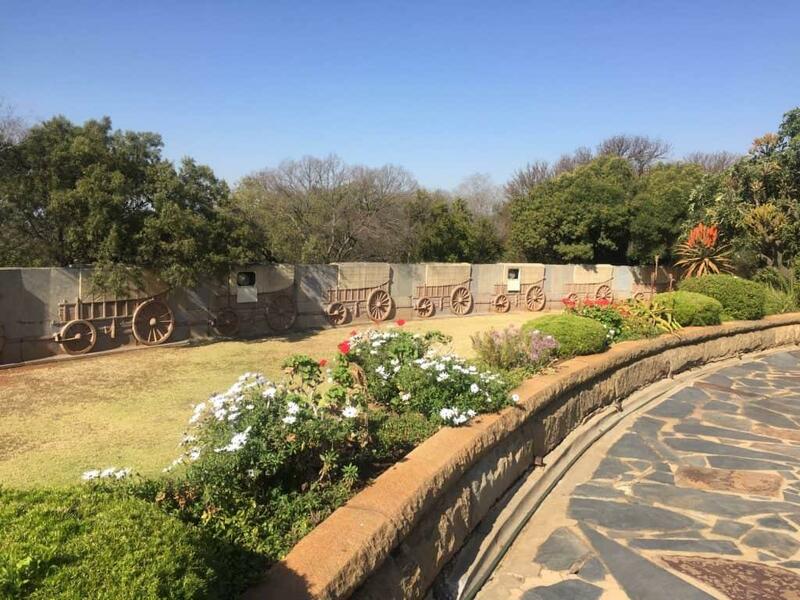 I retreated quickly, back down the staircase, stopping off at the various viewing points on the outside of the building that give sweeping vistas over Pretoria and Centurion. I carried on right down into the Cenotaph Hall, the level below the main hall. What an incredible piece of engineering. 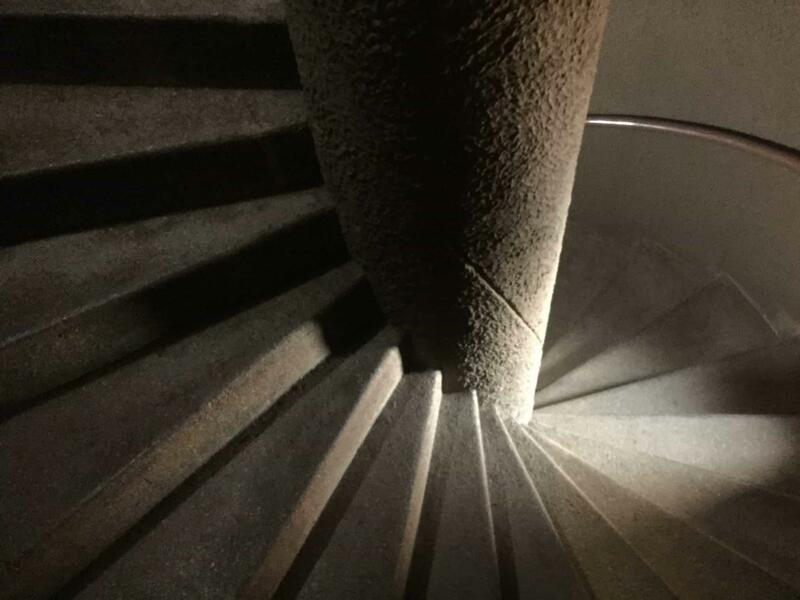 To design a small hole, bored thorough granite that is at the exact angle to lined up with the sun at an exact time on an exact day once a year. It’s not like you get multiple chances at something like that, cut the wrong hole 40 metres up and the entire roof needs replacing. I looked through all the other displays at the monument including the separate room giving vast quantities of information about the construction but found no further mention of it. 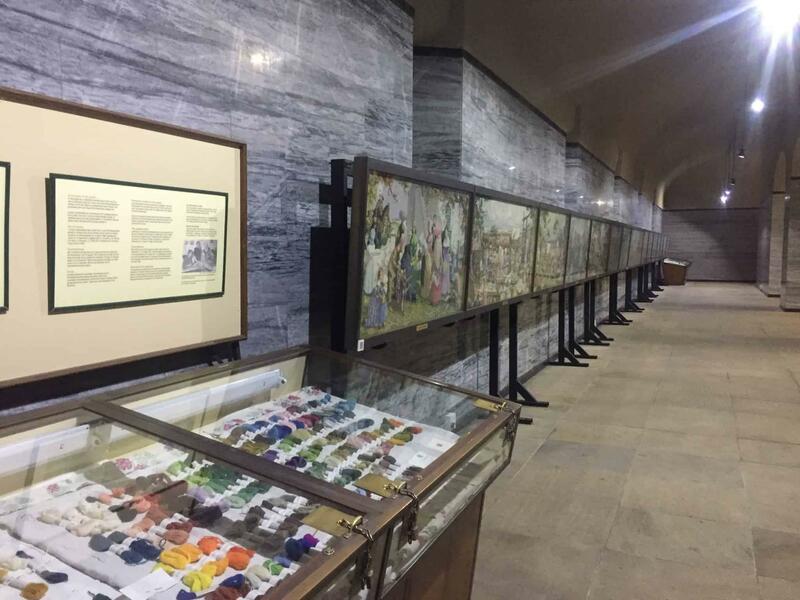 On the far wall of the Cenotaph hall is the tapestry celebrating the women of the great trek. Containing 15 panels it took 9 women 8 years to stich after artist W.H. Coetzer had painted the scenes onto gauze. It is said to contain 3 million stitches and must have been tedious work! The embroidery is so good you would be hard pushed to notice that it is not a painting until you get close. Hidden away in their own separate display are the original plaster moulds that were sent away to Italy to form the marble frieze. What was interesting about these was the additional information provided about each panel. 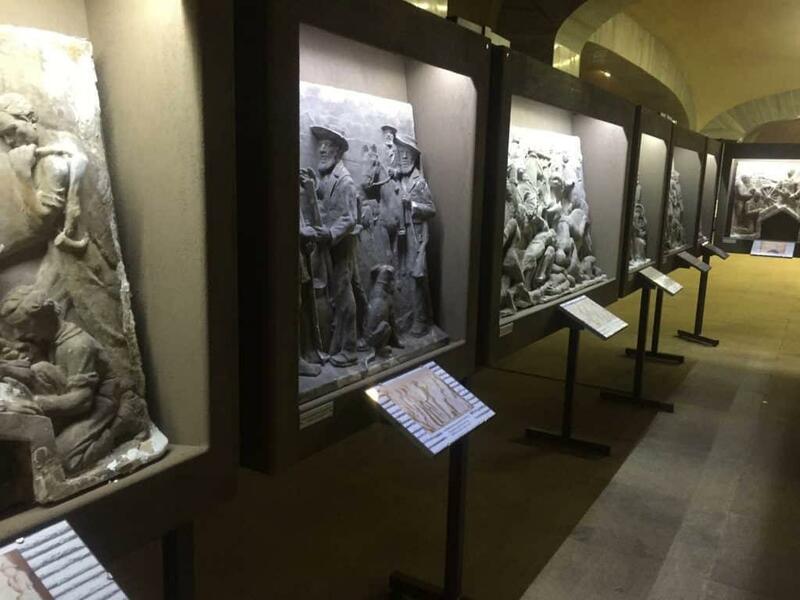 In the Hall of Heroes there is a small brass plaque under each panel, but here a broader background is given. The most interesting of these was under the mould which should a Voortrekker lady pulling at the leg of a Zulu who has his arm outstretched holding a torch. This frame was originally meant to show the Zulu swinging a baby by its leg bashing it into the ox wagon wheel. It was decided that this scene was too graphic and the baby was removed with the torch added. Viewing it with that in mind you can see how it was a late change, as the anguish in the lady’s body language now seems out of place. The Voortrekkers are Boers; descendants of the early Dutch settlers in the Eastern Cape in the 1700s. 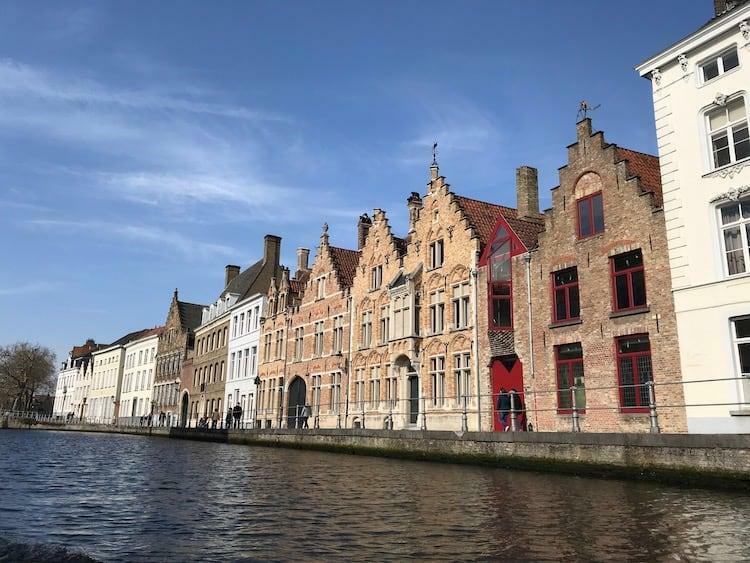 The area was originally controlled by the Dutch East India Company but after various engagement between 1795 and 1803 the colony was ceded to the British crown in 1814. After the Napoleonic wars, unemployment had become a massive problem in Britain. In 1820, encouraged by the Government, various groups emigrated to colonies around the world, including nearly 4,000 to the Cape Colony. This, amongst a host of other reasons, led to the Boers looking for new places to farm and in 1835, 12,000-14,000 Voortrekkers (Dutch word for pioneers, literal meaning ‘fore-pullers’) started out on the great trek east across the Orange River and through the Drakensberg Mountains. This led to the formation of new Boer republics of the Transvaal and Orange Free State which along with the British republics would later go on the form the South Africa we know today (see my article on the The Union Buildings). Along the way they settled in various places but also found themselves in conflict with the local tribes, the most significant of which were the Zulus. Led by King Shaka (a man so infamous he now has a restaurant named after him in Camden Market) the Zulus were also on a course of expansion, conquering neighbouring tribes to increase their power. After Shaka was killed by assassins in sent by his brother Dingane in 1828 and he then assumed the throne. Dingane met with Piet Retief, leader of the Voortrekkers in 1837. As a reward for recovering some stolen cattle Dingane signed over some Zulu land for the Voortrekkers to settle on (though this is disputed, as the King was unlikely to be able to read and the Zulus do not believe in the concept of land ownership). In 1938 after being invited to a feast the king had Retief and his party killed. In a scene reminiscent to an episode of Game of Thrones they were asked to leave their weapons outside as a mark of respect. After many rounds of feasting and dancing the chief jumped up and shouted Bambani aba thakathi! (Catch the wizards!) and they were dragged away to a nearby hill and butchered. The whole scene is set out in this eyewitness account. The following week Dingane sent warriors to kill the remaining 500 Voortrekkers in the area in the Weenen Massacre. In total 41 men, 56 women and 185 children were killed as well as another 250 Khoikhoi and Basuto that accompanied them. Andries Pretorius was one of the few survivors of the massacre. The key battle was in December 1938, the aforementioned Battle of Blood River, key elements of which are remembered at the monument. The light that shines onto the cenotaph only comes through on 16th December every year, which is the anniversary of the battle, and the 64 ox wagons surrounding the building are the same number used at Blood River. Andries Pretorius led the Voortrekkers who, whilst being outnumbered (there were an estimated 80,000 Zulus to 470 Boers), used location and superior firepower to their advantage. Having pulled up their wagons into an impenetrable laager the Voortrekkers fought off the Zulus with canons brought up from the Cape. An estimated 3,000 Zulus were killed with no casualties on the Boer side. 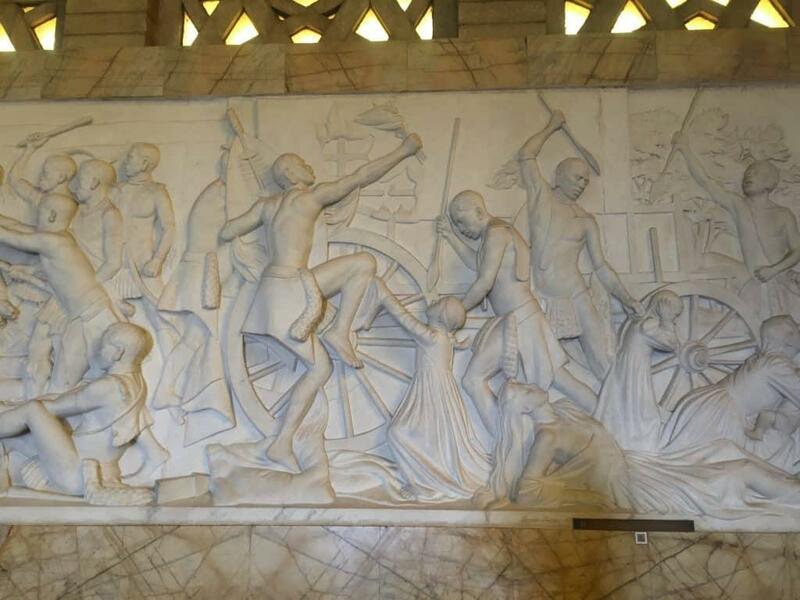 If you’re in Pretoria and have a few hours free I would strongly suggest a visit to the Voortrekker Monument. 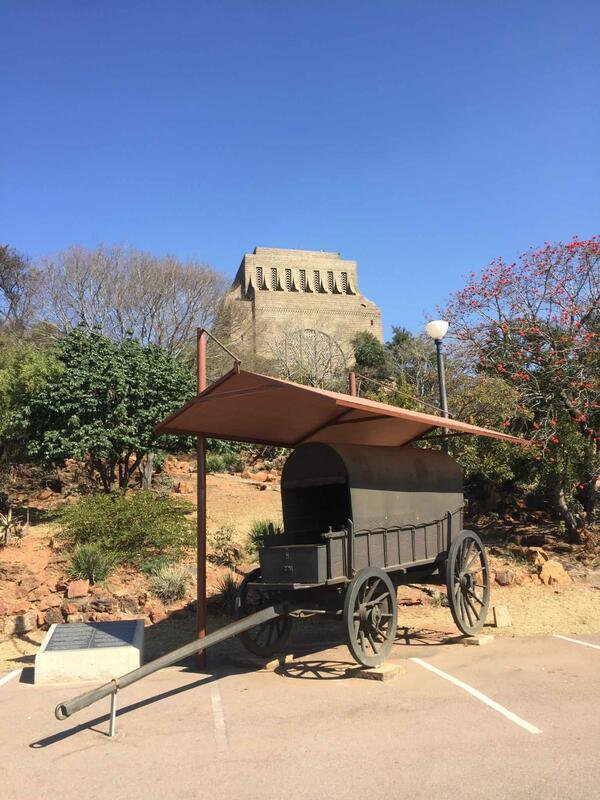 The architecture is worth the journey alone but the museum and friezes really give you an insight into the history of the The Great Trek which is regarded by Afrikaners as a central event of their 19th-century history and the origin of their nationhood.